The day of the Summer Solstice we set off, in the rain, for our next destination, Rockaway Beach, OR. We cross the 45th parallel (the midpoint between the equator and the North Pole.) Our home this week is the Paradise Cove Resort and Marina, an AOR, ROD and RPI affiliate. 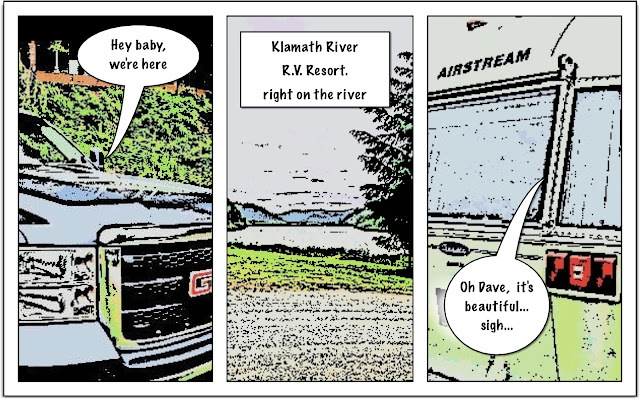 Like so many RV resorts, this one has seen better days and our space is at the end of a tightly packed row but we have a spectacular view of the bay and there is decent Wi-Fi in the clubhouse, which is situated at water’s edge. The sewer connections are a tad odd – they drain horizontal – something we have not encountered before – but everyone seems to have some solution that ranges from special adapters or bungee cords or large rocks to hold the sewer lines in place, we should never underestimate the ingenuity of our peers. After setting up, we headed a couple of miles up the road to the town of Wheeler in search of either groceries or a hamburger diner. Since we found the Tsunami Bar and Grill before a grocery store, hamburger won out. Chris’ hamburger was cooked perfectly and was accompanied by awesome onion rings (no kidding awesome!) After perusing the menu, the steamer clams called my name. They were cooked to perfection in a white wine reduction and a side order of garlic bread made a complete meal. This restaurant recently moved from a mid block location across 101 to their current waterfront spot and just had their “soft opening” five days prior. It was early evening and they were already sold out of a number menu items. Seems they underestimated just how many people would come to dine in their new location. To sum it up: great food, great service and killer location and views. 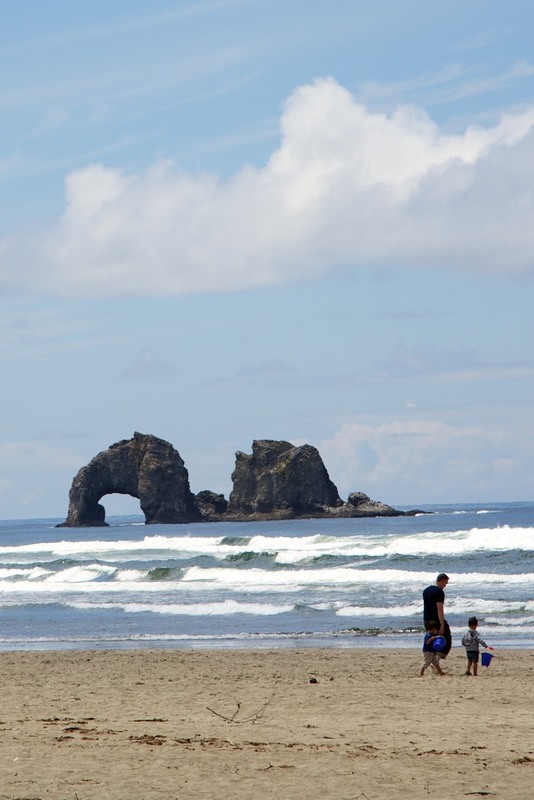 Rockaway Beach is located about mid way between Tillamook (of the cheese fame) and Cannon Beach (of the beach fame.) In Tillamook, we visit the Tillamook Air Museum. 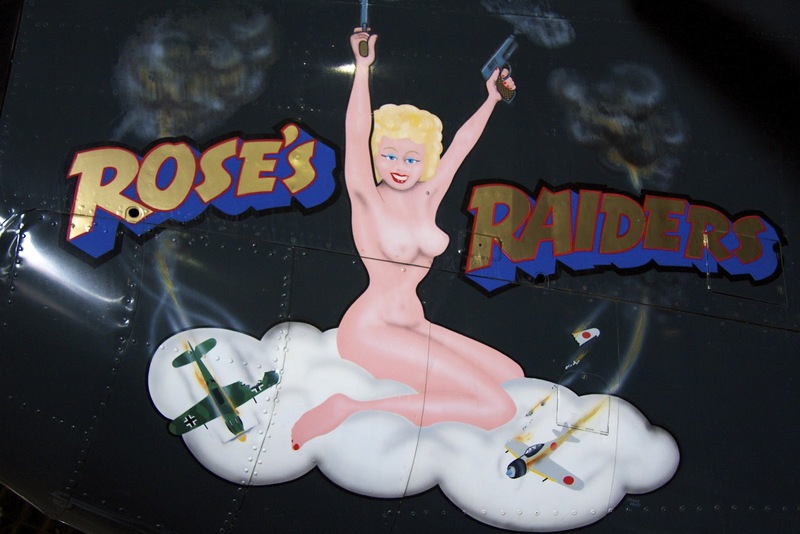 The museum is in the remaining Blimp hanger from WWII and according to their website, houses one of America's finest collections of over 30 magnificently restored war birds including a P-38 Lightning, F4U-Corsair, P51-Mustang, PBY Catalina and SBD Dauntless dive bomber. It is definitely worth a stop for anyone interested in the history of flight or WWII aeronautics. We noticed a small sign on the road to the museum indicating a fish hatchery up the road. So after visiting the planes we figured, “What the hell, we’re here, lets check it out.” Signage was a bit sketchy, but we finally found the Trask Hatchery at the end of an unpaved road. Sometimes we just don’t give up. It paid off as we were given a wonderful one-on-one tour of the facility. This hatchery was constructed in 1916 and is used for adult collection, incubation, and rearing of fall and spring Chinook, Coho, wild winter Steelhead and hatchery winter Steelhead. 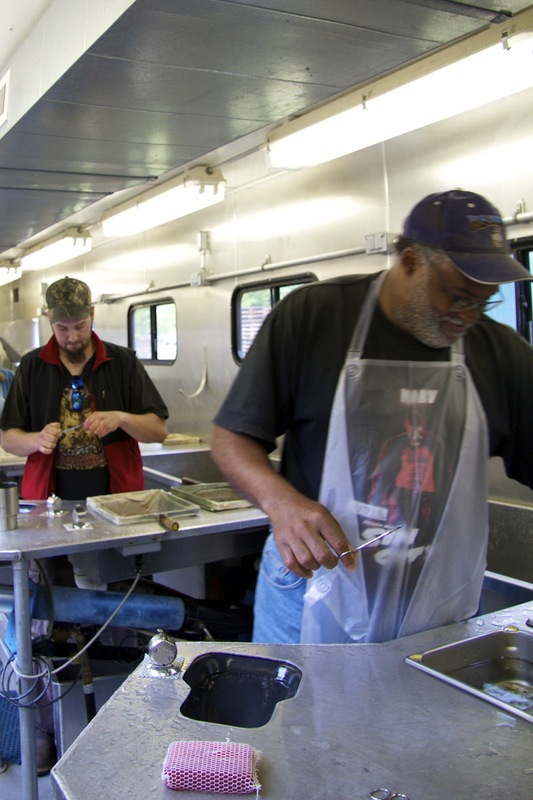 They were in the process of “clipping” a somewhat controversial process of cutting off the fat fin on the back upper tail of fingerling salmon to differentiate hatchery fish from wild salmon. Even though they have a quota of 1,000 clips per hour, the five techs were friendly and willing to share the process with us. On Saturday we ignored the rain and went back to Tillamook for the farmer’s market. We picked up some Kumimoto oysters, some so-so fruit turnovers, fresh veggies and CRACKERS. Yes Crackers, the hi-light of the day. So here’s the back story: We were down to our last partial package of Rain Crisp Crackers from Taylor’s, our gourmet market back in Sacramento and we had all but given up on finding any crackers of that quality any time soon. Walking through the market, Chris spotted the crackers and this is how we met Jan Skelton of More Than A Cracker. Jan offers three flavors in regular and gluten free. We found the gluten free to be more flavorful and actually better than the Rain Crisp Crackers, so we stocked up and now we have crackers for a while, and when we run out, we can order more on line - and so can you :o) HERE! We also stopped at the Tillamook Cheese Factory. You can’t miss this huge plant right on the 101 at the north end of town. They have a self-guided tour and you can watch the packaging of the famous bricks of Tillamook Cheese. Since this cheese is readily available at most supermarkets, we didn’t fight the crowds in the gift shop and store, but we did grab a couple of Tillamook ice cream cones which were pretty tasty. One stop that we would not revisit was the Nehalem Bay Winery. The wines there are not to our taste. Half of the offerings were the novelty type sweet fruit based, pear, berry etc. The more traditional wines all had a strong chemical flavor that reminded us of Los Angeles Tap water and were extremely dry to the point of being really sour. Tastings were $5 per person, but applied to purchases. Prices were high $20-$35 in our opinion for the quality. The scenery is incredible along the drive up the coast up to and past Haystack Rock at Cannon Beach. 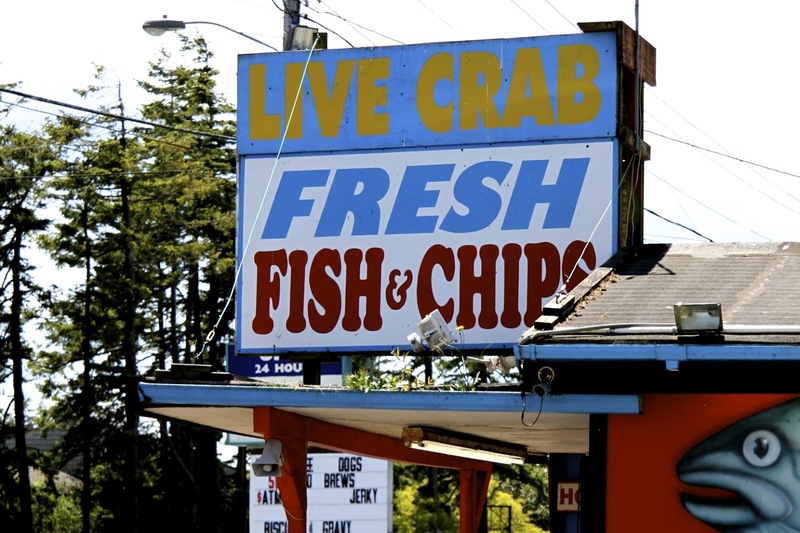 After photographing along the beach, we decided to walk through town and do a little window-shopping and grab a bite to eat. 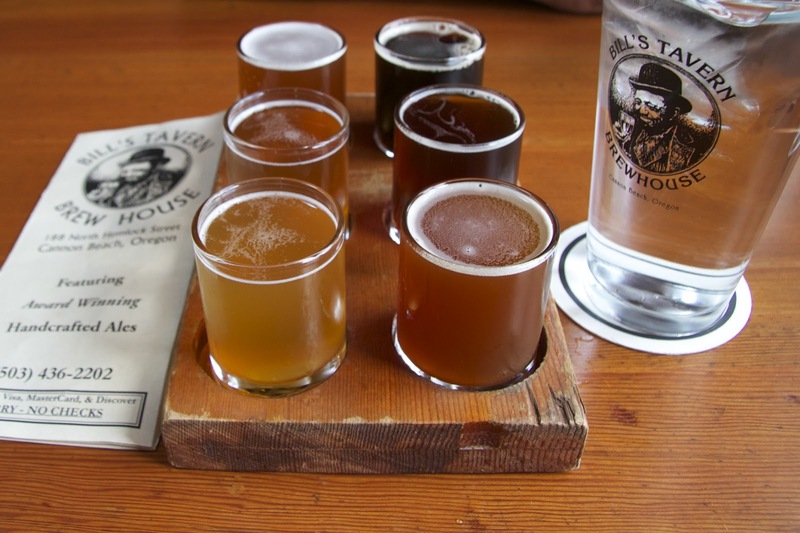 We stopped at Bills Tavern and Brew House. There we ordered a 6 shot sampler of their seasonal beers. The beers were all tasty. Our favorites were Rudy’s Red and the 2X4 Stout so we ordered a couple of pints to go with grilled oysters and fish and chips. It’s tough to make fish and chips outstanding or memorable, but these were some of the better we’ve had. The batter was light, the Halibut moist and succulent and the “chips” crisp with tender insides. Nothing was greasy, just fried to perfection. The Oysters were a real treat. They were dusted in panko, lightly fried and accompanied by the same perfect fries. We also substituted the clam chowder for the salad and were not disappointed, great flavor and texture without being overly starchy as some chowder’s can be. All in all: a most excellent meal! So another week of good, bad and fun, lots of rain and a little sun… but we wouldn’t change a thing! Click here for this week's photos. Flag Day 2012 has us leaving Gold Beach and heading to South Beach, just below Newport, OR. (Still going north for those of you who are keeping track.) Every town along the 101 has lined the highway with hundreds of American flags. We feel like we are in our own Dave and Dimples parade. This weeks foraging nets, assorted spring veggies and an Auspitable rack of ribs from the Newport Farmers Market, crab and fresh halibut cheeks from the South Beach Fish Market, a nice selection of artisan beers from the Rogue Brewery and Kumimoto and Native Oysters from The Oregon Oyster Farm. Despite all of this fine in-home dining we are both loosing weight, we credit this to our newfound lack of stress. On Friday we drive up to Lincoln City to do a little outlet shopping. On the way back, we stop at Lee’s Chinese restaurant. From the looks of it, this place has been around for a long while. Visualize shabby, not shabby chic. However, the aromas convince us that this place is worth a visit. Their Mu Shu Pork is some of the best we have had and the Dragon and Phoenix dish delectable! Seasoning on both dishes is unique and the portions are good sized. Two entrees and an appetizer of Crab Pops fill us up and we have tasty leftovers for the next day. 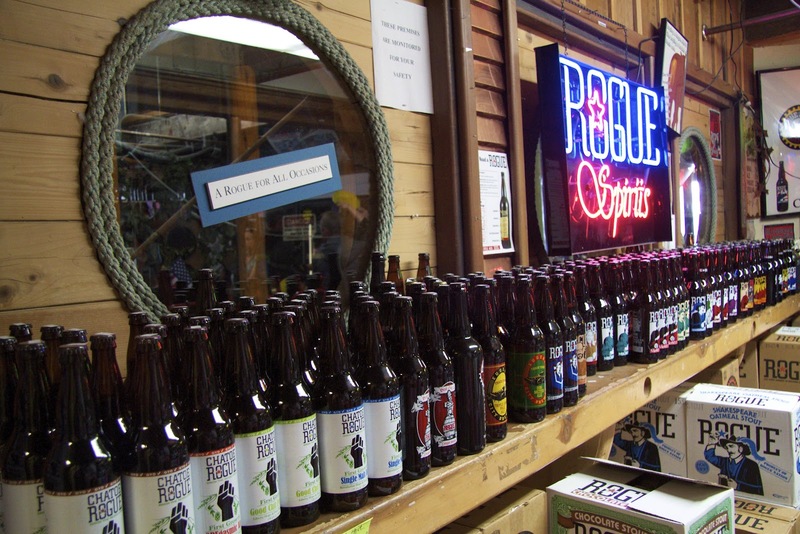 Rogue Beers are available throughout the United States and in over 30 countries. 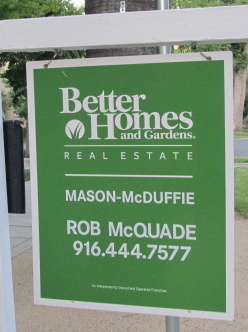 The remarkable thing about this company is that they do not advertise. They put money that would be budgeted for ads back into their community. They buy used equipment and are rabid recyclers. They are currently expanding their operations in Newport to add 30 jobs. This is significant in a town with a population around 10,000. It’s all about the beer. 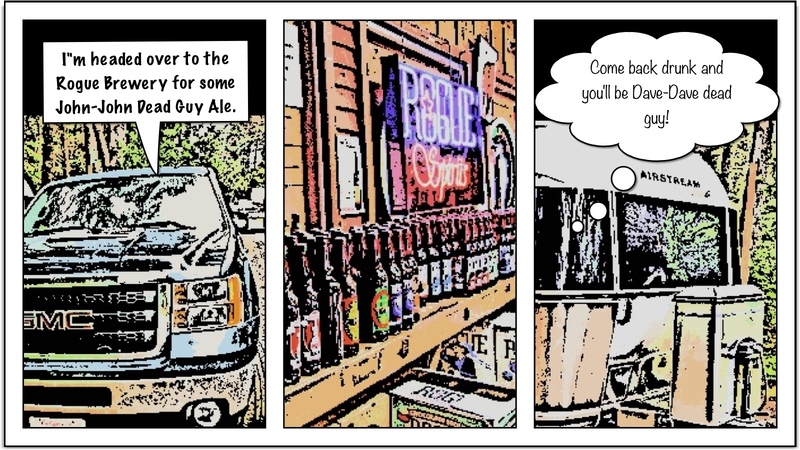 D&D Tip of The Week: Be a responsible drinker and order a Rogue beer if you see it on tap. 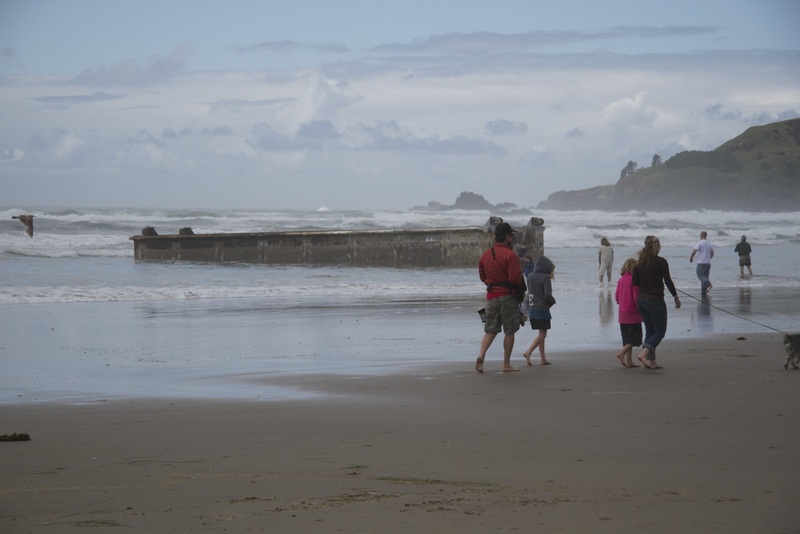 The one unexpected attraction is the 66 foot Japanese dock, ripped free by the Tsunami of March 11, 2011, taken by the Kuroshio Current north past Alaska, down the pacific coast and deposited on Agate Beach on June 6, 2012. As more debris from this devastation arrives on our shores, we are reminded of the power within our planet. This beautiful coast of our country sits on the active Cascadia Fault. Quakes and tsunamis are a reality here and someday this landscape will be transformed. Click here for more info. We’ve also made some decisions as to the direction we’ll head in the next month. Our next stop, Rockaway Beach, is our final Oregon destination. (This time through.) Then it’s on into Washington State and northeast toward Yellowstone. We will be staying in Yellowstone for four weeks starting late August. Click here for this weeks photos. Rogue update: The John-John Dead Guy is perfect with Kumimotos and Natives on the half shell and the Chipotle Ale compliments Chris’ home made salsa beautifully. The first thing on our agenda was foraging for this week’s food supply. A quick check on-line (thanks to the really fast Wi-Fi) pointed us to Fishermen Direct at the harbor where we picked up a really fresh Dungeness crab and a few staples including jars of spicy pickles and habanero jelly. We really didn’t need the pickles, but they looked intriguing and well, it’s hard for us to pass up anything habanero. (Once we finish the old jar of pickles in the fridge, we’ll open these baby’s up and let you know how they are.) Heading back into town we spotted a sign for fresh bread at the Rogue River Apple Works (right next to the Rogue River Myrtlewood Shop.) There we met owner, Mary Bronstein who was putting labels and cute little calico caps on her latest batch of jellies. Unfortunately for us she had sold out of that day’s bread. But since we were there, and not wanting to waste a good stop, we decided to taste her jellies. She pointed us to her limited edition Tayberry jam. (Tayberry is a hybrid of raspberry, blackberry and olallieberry.) All we can say is YUM YUM! For Mary this shop is her dream and her products are proof of her love of the magic of fruit chemistry. To support her business, she works nights as a full time caregiver. Mary admits that she was probably born a hundred years too late, she may be right, but without the benefit of a Rocky and Bullwinkle way back machine, we wouldn’t be able to taste her jellies, so we’re glad she is in the present. Last stop was McKay’s Market where we finished up on the staples. 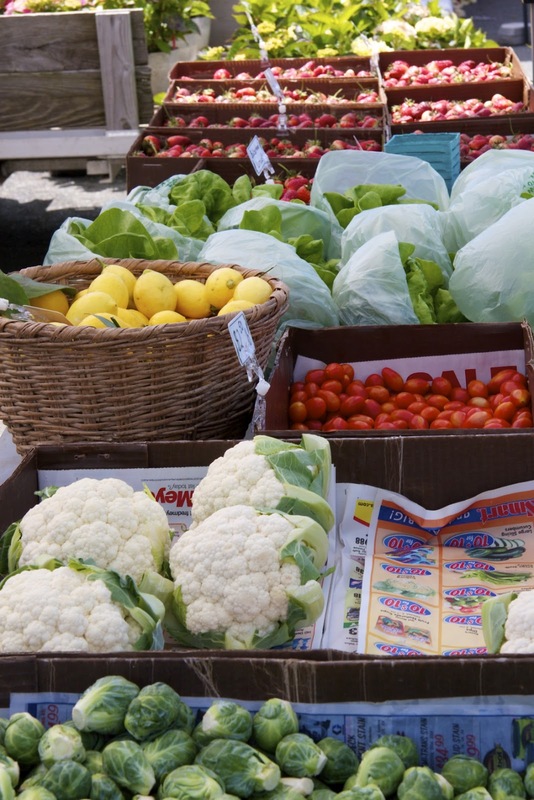 Saturday, we visited The Brookings Harbor Farmer’s market. There we saw all three farmers. Now you might think that this might have been a waste of time, but let us assure you, those three farmers had it all covered: fresh stone fruits and figs, all general seasonal veggies and some of the best ripe-right-at-this-moment strawberries we’ve ever tasted. There were also two bakeries and a vendor selling homemade tortillas and tamales. So with all of our foraging complete, we stopped in at Sportsman Marina for some award winning clam chowder. In Gold Beach it’s all about the beaches. During our stay we hiked and photographed, Gold Beach, Nesika Beach, and Meyers Beach. Click for photos. 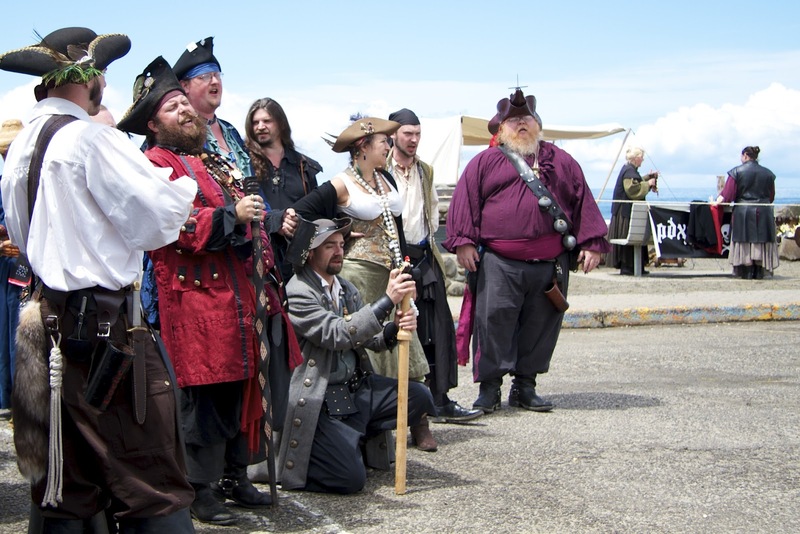 Aside from the spectacular scenery, two highlights of our visit were the Rogue River Paddle Board Race and 2012 Gold Beach Stand-up Surf Competition. Both events were sponsored by The Inn of the Beachcomber as part of the run-up to the 2012 American Windsurfing Pistol River Wave Bash. Sunday morning, we caught the Paddleboard race in the harbor and the Surf Completion on Tuesday was a mere 100 yards from our front door. What a treat to watch these world-class athletes compete. Click for photos. More Photos. 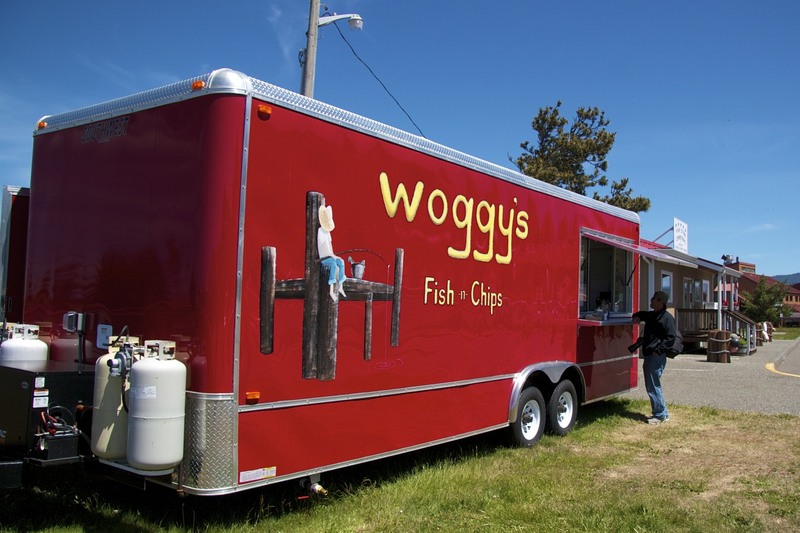 On Sunday, while we were waiting for the athletes to return from their 7+ mile (professional) and 4 mile (amateur) races, we grabbed a bite at the Woggy’s food truck. 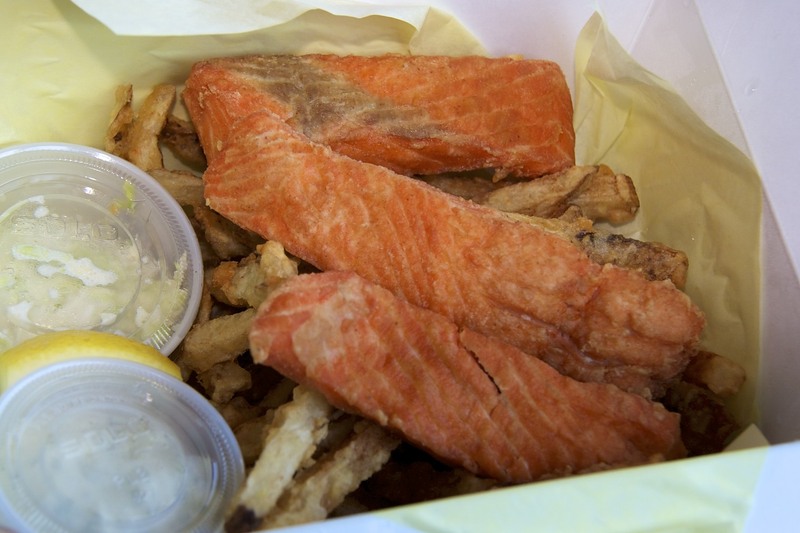 The husband and wife/Owners/Executive Chefs, Kim and Philip cook up a mighty mean special of salmon fish and chips as well as fish tacos, burgers and chicken dishes. From the seasonal specialties, home made tartar sauces, dried fruit laced slaws and hand cut fries; all of their food is fresh-fresh-fresh and yum-yum-yummy. 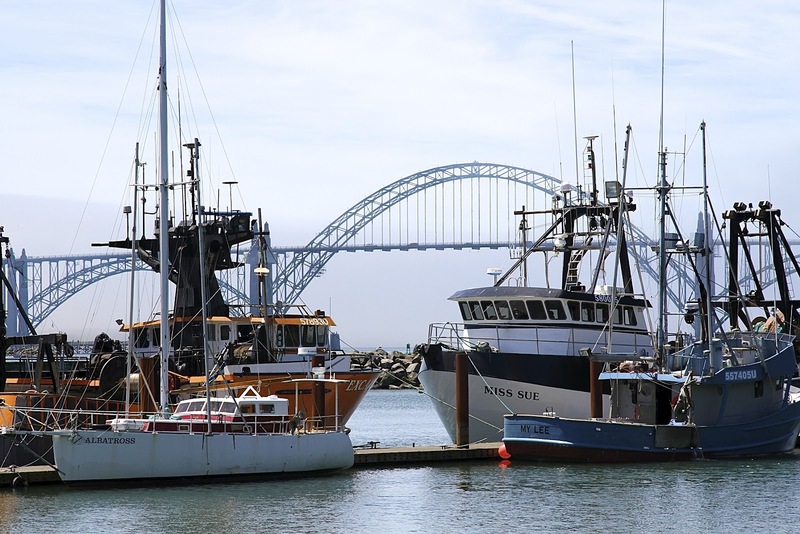 Kim is a born and bred Gold Beach native and the business is named after her dad; A commercial fisherman who provides most of the seafood. So if you find yourself in Gold Beach, stop by the harbor and fill your belly with some great fresh mo-fo food! So after a wonderful week of tasty food, beautiful beaches and world-class athletes, we’re heading farther north. Next stop, South Beach (Just south of Newport) still in Oregon. We arrived in Klamath, CA early afternoon and checked into the Klamath River RV Park. This park is a giant green resort situated right on the bank of the Klamath River. Think lawns forever… beautiful landscaping and uber clean restrooms, laundry room and facilities. Owners, Jack and Al were friendly and made us feel right at home. Jack made sure we got the best river view spot in the park. (Thanks Jack!) The camp hosts were also helpful and gracious. They have a list-o-rules that might put some folks off, like no large outdoor mats (harms the lawn) and they’ll eat your dog if you don’t clean up after it, (just kidding… they’ll actually eat the owner.) OK… truth… It’s a $75.00 fine for not picking up Fido’s do-do which is reasonable from our perspective. They have Wi-Fi (albeit a tad slow) available at each site for a small fee. It is also close to Hwy 101 and within a short distance to all of the sights of this northwestern corner of California. So at this moment in time, this is perfect! Just south of Klamath is the Prairie Creek Redwoods State Park, 14,000 acres of coastal sanctuary for old-growth Coast Redwood trees. 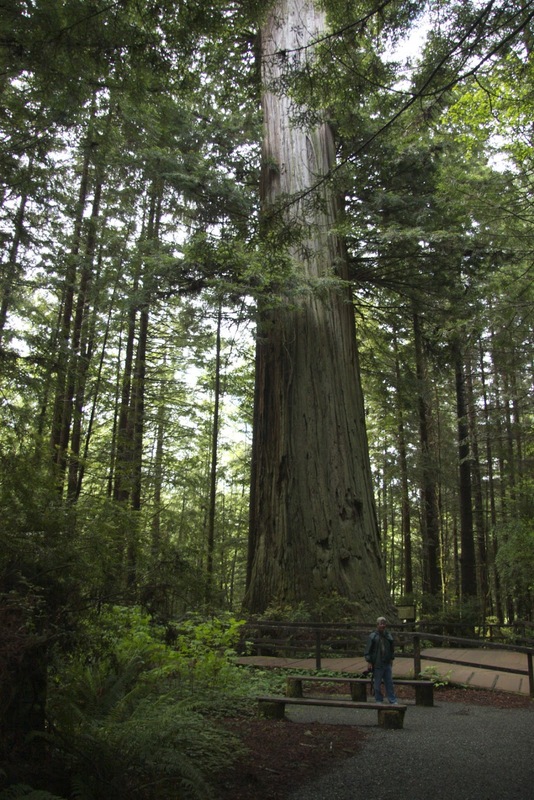 The California Department of Parks and Recreation and the National Park Service jointly manage the Redwood National and State Parks. These parks (which includes Del Norte Coast Redwoods State Park, Jedediah Smith Redwoods State Park and Redwood National Park) have been collectively designated as a World Heritage Site and International Biosphere Reserve. If you are constrained by time and finances, spend your time here! The meadow along the Newton B. Drury Scenic Parkway, with its population of Roosevelt elk, is considered a centerpiece of the park, located near the information center and campground. Other popular sites in the park are Fern Canyon and Gold Bluffs Beach. Late spring brings a bounty of wildflowers, which we were fortunate to observe and photograph. Click for photos. 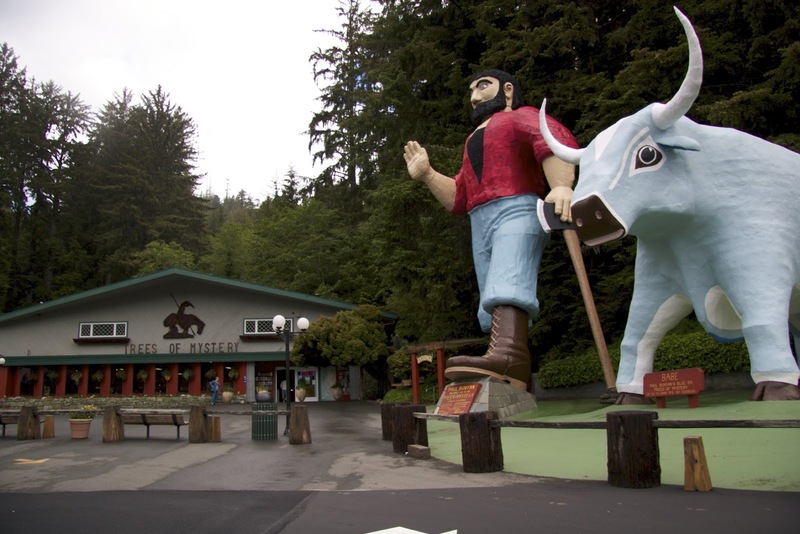 Heading north toward Crescent City are numerous roadside attractions that must not be missed. 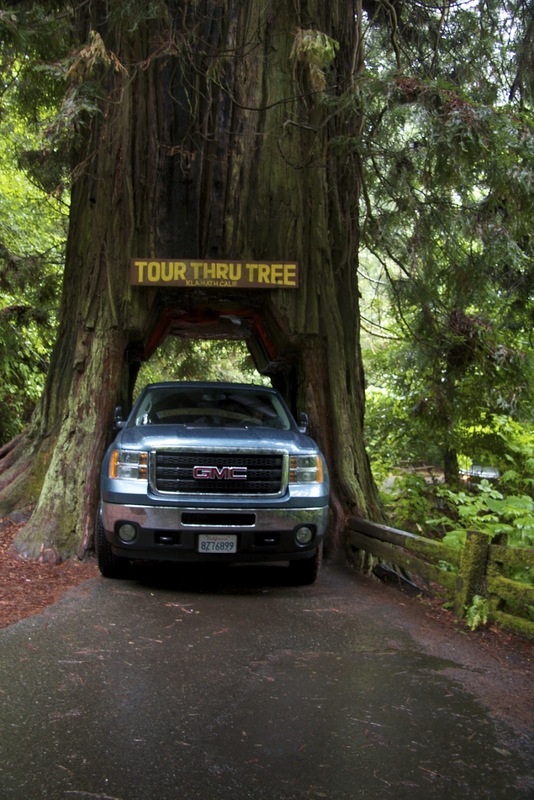 The Tour Thru Tree is one of three giant redwoods in California carved out (some may say mutilated) to allow traffic to flow through. Regardless, it was a kick (for a mere five bucks) to fold in Dave’s mirrors and slip through with bare millimeters to spare. Proof to the left- NOT PHOTOSHOPPED! Seriously, we are talking mini fractions of inches for those not versed in the metric system! 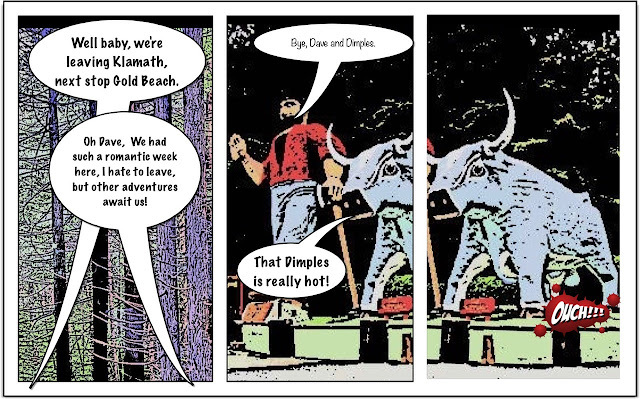 You can’t miss the Trees of Mystery with the ginormous Paul Bunyan and his anatomically correct blue ox Babe. This attraction is definitely worth a stop as it contains a number of unique tree formations, which instilled a fear of spirits in the early indigenous population- hence the name “Trees of Mystery.” Be sure to take the sky trail gondola (included with the admission price) that rises 571 feet to an observation deck for a spectacular view of the Pacific Ocean and surrounding forest. After spending a few hours basking in all this natural beauty, treat yourself to a bit (or a bunch) of the tasty fudge (OK, it's not as good as Moni Vancamp's, but Moni only shares her fudge with friends, so if you are not a friend of Moni, this is the best fudge you can get.) in the gift shop. And finally, allow enough time to explore The End of the Trail Museum, a large private collection of Native American art, crafts and tools. Click for photos. 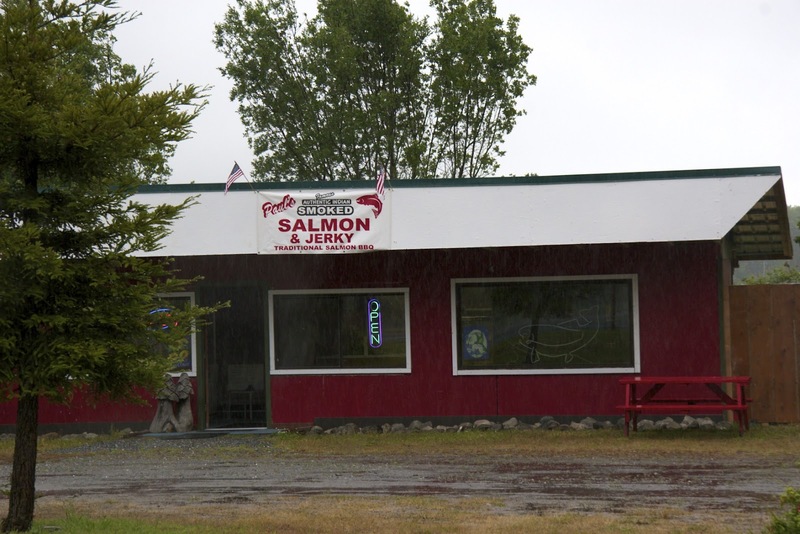 Be sure to stop by Paul’s Authentic Smoked Salmon shop and pick up some of the tastiest smoked salmon products on the west coast. A half pound of the five-day smoked netted three meals for us – Breakfast: bagels with all the fixin’s, Light Supper: on crackers with soft cheeses and Dinner: tossed into Fettucini Alfredo with capers. YUM! 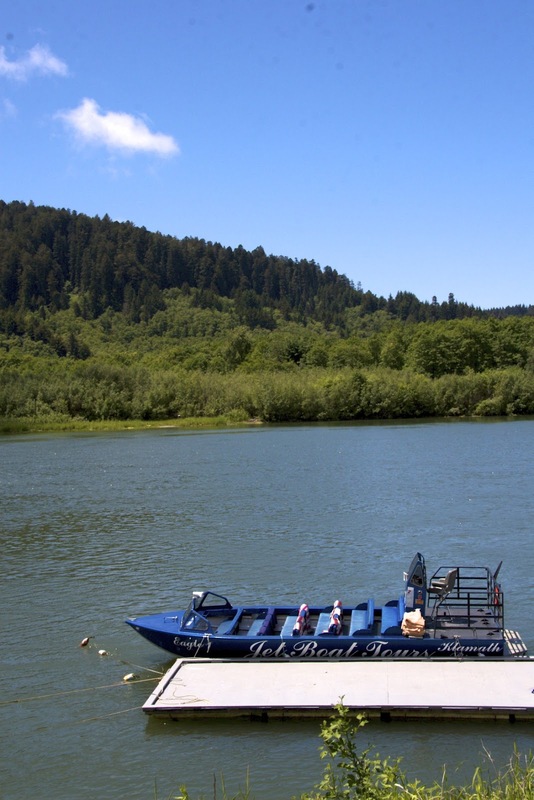 If time and budget allow, the Jet Boat Tour up the Klamath River is great. The two-hour tour includes the estuary where seals lounge and seabirds do seabird stuff along the shore, and an occasional spout from a migrating whale can be seen past the breakwater. Up river we were treated to numerous blue heron, duck, geese, osprey and bald eagle sightings. Two highlights (which unfortunately we were unable to capture on film – you’ll just have to take our word for it) were: a normally nocturnal green heron quickly darting into the foliage and a young black bear running really fast away from the river. Of course the river, the backcountry and the high speed 360 degree turns are worth the price of admission. One note, although we looked really hard, we did not see Bigfoot. 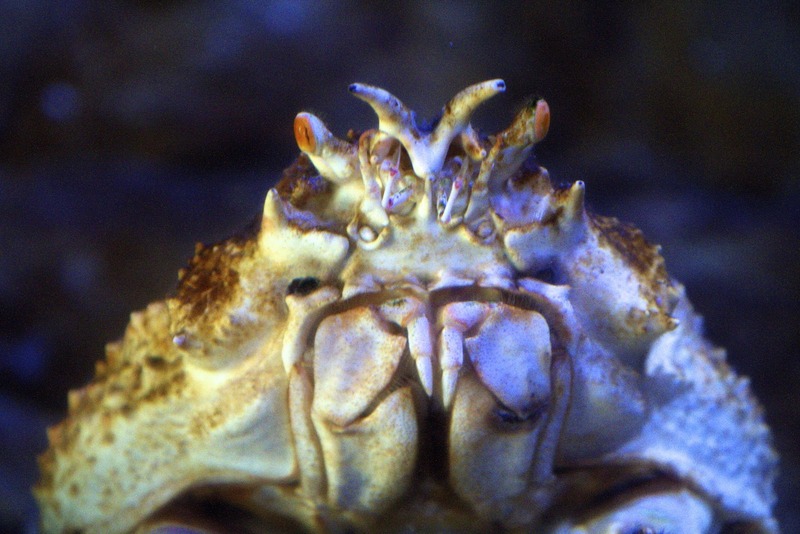 (But I swear it felt like he or she was watching us.) Click for photos. Crescent City is 20 miles north. Be sure to check out the Crescent lighthouse and Point St. George. One pleasant surprise was some really tasty sushi at Sushi Kyu in the Safeway shopping center. 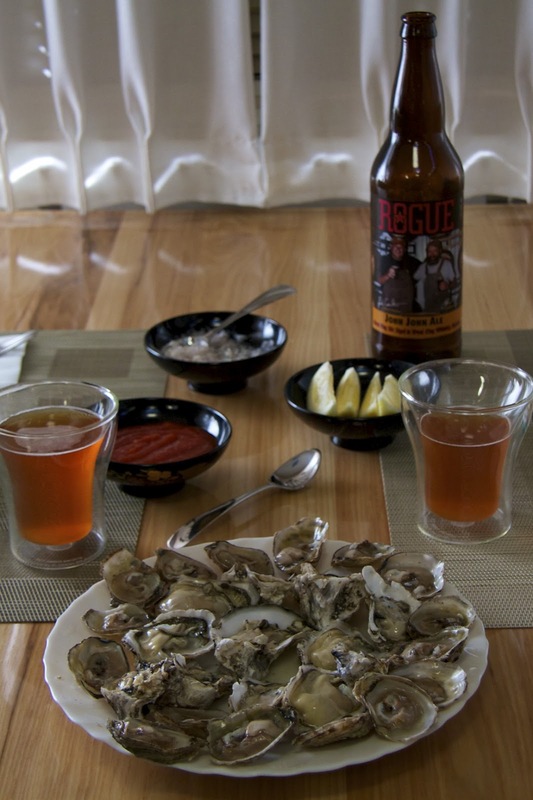 We understand that this is a relatively new addition to Crescent City's epicurean choices. Other than waitstaff who have not been schooled in the unique flavors offered, we found, great ambiance, beautiful presentations, and creative "specials." The Dungeness roll and the Black Kitty roll are well worth the stop. "How does Gold Beach, OR Sound?" Once the house was in escrow we called Estate Sale Goddess Jennie Krause. Jennie and her talented staff whirled in, organized, staged, priced and sold all of our possessions the weekend before close of escrow. The night before the sale we walked through the house. All of our possessions were laid out ready for their new owners. It felt good to know that someone else would enjoy these items. It was also incredibly liberating. We are no longer held hostage by all this stuff. Only the very bestest of the best gets to come along ;o). Sunday we returned to Sac to check the house and meet up with friends for dinner at Hot Italian and afterward drinks at Gallagher’s Irish Pub. Monday and Tuesday were spent tying up loose ends and then we headed to the Redding area to spend a week with family, cooking, eating, and musing about the future. It’s hard to believe that the Dream is now reality. Now we’re off to seek out new life and civilizations to boldly go where we have not gone before.